Successfully Added Clipper Bluetooth Stereo Headset (Built-in MP3 Player + TF Card Reader) to your Shopping Cart. Simply connect this little device to your Bluetooth enabled cell phone or MP3 player, escape the noisy world, and lose yourself in your favorite music. When a phone call comes in, just tap one button to smoothly switch to answer it. When you hang up, your music will resume automatically from where you left off. Life is so much better with this tiny little Bluetooth device. 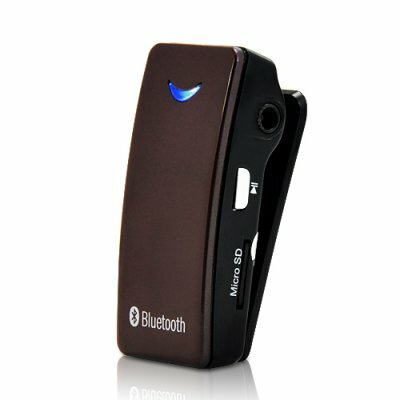 Even if your cell phone does not play music, or you do not already have a Bluetooth enabled MP3 player, no worry at all. Unlike any other Bluetooth stereo headset on the market, this one plays music itself with its built-in MP3 player! Enjoy music on the go without buying an additional expensive MP3 player. Elegantly design with a clean and sleek look, the Clipper Bluetooth stereo headset can be clipped on your shirt, jacket, t-shirt or whatever that fits your needs. Start enjoying wireless stereo music and crystal clear hands-free phone calls with this all-in-one Bluetooth stereo headset. Buy one for yourself today, or order bulk quantity at unbeatable wholesale price to sell and PROFIT! Available from your trusted source for high quality low price electronics, Chinavasion. The headset can be recharged from computer USB . By doing a simple pairing with your Bluetooth capable mobile phone, smart phone or PDA, you will be ready for an active day ahead and have easy access to all your calls, while enjoying your music at the same time.